Eye'll bee damned: woman finds insects in eye - SABC News - Breaking news, special reports, world, business, sport coverage of all South African current events. Africa's news leader. The tiny insects, which are just three milimetres (one-tenth of an inch) long, were discovered after the woman - known only as Ms Ho - sought treatment for an itchy and swollen left eye. 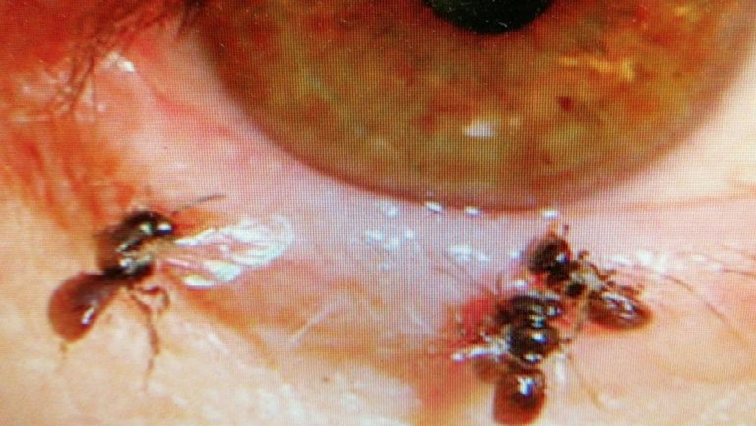 Four “sweat bees” that had been living in a Taiwanese woman’s eye were removed by a doctor who described his surprise at finding a “leg with hair, protruding from the eyelid”. The tiny insects, which are just three milimetres (one-tenth of an inch) long, were discovered after the woman – known only as Ms. Ho – sought treatment for an itchy and swollen left eye, Dr. Horng Chi-ting said. “I think the Halictidae mistook the eyelid for an armpit,” he told AFP, using another name for “sweat bees” that are attracted to sweat, adding it could be the first case of its kind worldwide. Horng looked closely at the woman’s streaming eye and “was surprised to find a back leg with hair protruding from the eyelid. I didn’t know what the insects were,” he told AFP. He then sent the insects to a professor at National Taiwan University for identification. The 29-year-old woman’s ordeal began when she was out weeding her ancestors’ graves at the end of last month and felt a gust of wind blow something into her eye, Horng said. “Luckily the Halictidae didn’t attack her eye and they were removed relatively quickly,” he said. It took Ms. Ho three days to recover, Horng said. This entry was posted on 11 Apr 2019,09:49AM at 9:49 AM and is filed under mobile-leadstory, Sci-tech. You can follow any responses to this entry through the RSS 2.0 feed. Both comments and pings are currently closed.